Although the Brady Bunch had previously been exhumed from the cancellation graveyard with the infamous 1976-77 "Brady Bunch Hour" and short-lived "Brady Brides" in 1981, by 1988 America was nostalgic enough for the lovely lady, man named Brady and their three very lovely girls and three boys that a reunion this time would really be appreciated, and what better time to do it than Christmas? 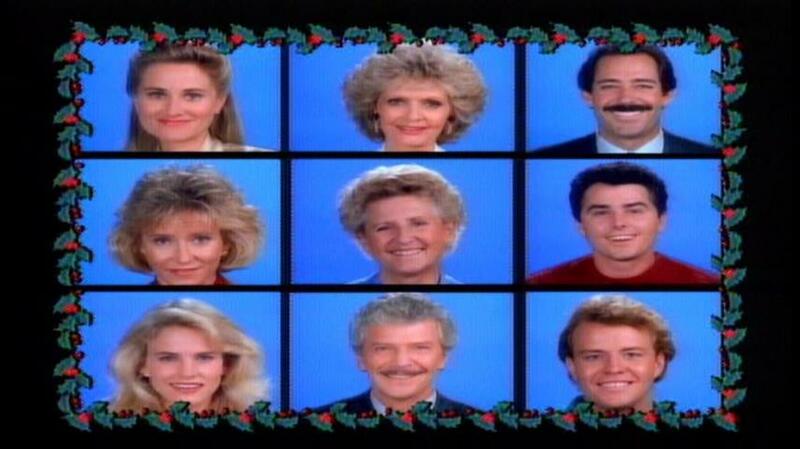 "A Very Brady Christmas" brought the group that somehow formed a family head-on into the 1980s and ended up as the year's highest-rated network broadcast, paving the way for one last attempt at a new series "The Bradys" in 1990 which still didn't go anywhere and was canned after just five episodes. This "TV movie event" was first issued on DVD as part of the Brady Bunch "Complete Series" set, which was annoyingly released right after Paramount had finished releasing all five seasons individually. Those who bought those as they came out and refused to re-buy them can now finally get this on its own. With the six kids grown up and moved out, Mike (Robert Reed) and Carol (Florence Henderson) have the house to themselves, modernizing it with updated d�cor and a window in the kitchen. They've also kept up with the times by turning the den into an exercise room. Mike still makes the big bucks as an architect but Carol has also gone to work as a real estate agent. With Christmas coming up, each figures the perfect gift that year will be a surprise vacation- Carol plans on Greece while Mike figures on Japan. Each one surprising the other with a vacation at the same time has all the makings of a typical sitcom mix-up, but the secret gets spilled before it goes too far. They then figure that they should instead spend the money to bring all their kids home for Christmas. While it isn't made clear how far away they've moved, it still seems like mom and dad shouldn't have to give up a vacation just to get them back home but this all has to be a big enough deal to fill out a two-hour time slot. Greg (Barry Williams) is now a doctor and sporting a somewhat creepy mustache, married to a nurse named Nora (Caryn Richman), with one kid. 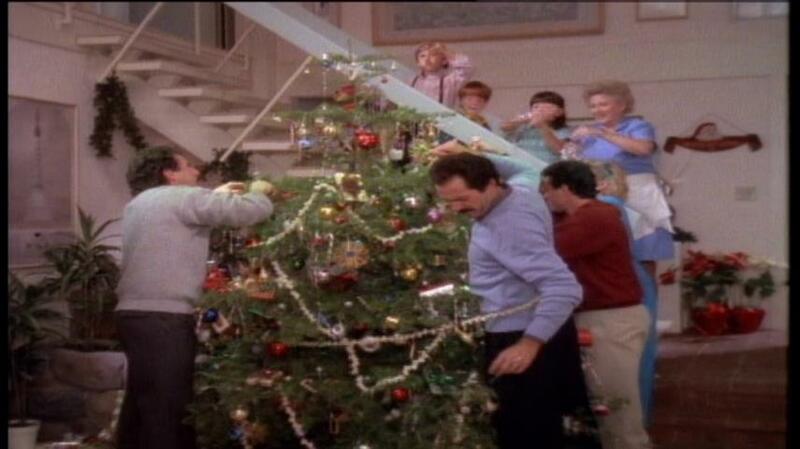 Marcia (Maureen McCormick) is married (with two kids) to neurotic toy company executive Wally (Jerry Houser) who's just been fired from his job, while Jan (Eve Plumb, looking unrecognizable here) has followed in her dad's footsteps and become an architect which ends up taking a toll on her marriage to professor Phillip (Ron Kuhlman)- in fact, the two of them are about to separate but decide to put on a charade for the family when they're suddenly invited over. Peter (Christopher Knight) hasn't gotten hitched yet but has a thing going on at work with his boss Valerie (Carol Huston), who comes along for the reunion although Peter is a bit jealous of her ranking higher and making more money than him. The youngest two are still finishing up college, although Bobby (Mike Lookinland) has secretly dropped out to pursue his dream of becoming a racecar driver while Cindy (Jennifer Runyon filling in for Susan Olsen as she was on her honeymoon at the time, although she did come back for "The Bradys" series) would rather go off with her friends on a skiing trip and comes home just because she figures she's expected to. And what about housekeeper Alice (Ann B. Davis)? Well, her services haven't been needed in a while, but she shows up at the Brady house seeking emotional support after it turns out that she married Sam the butcher a while back but he's suddenly left her for a younger woman. Mike and Carol let her stay to pull herself together, and she can't resist resuming the cooking and cleaning from that point on. Of course all of this is just an excuse to get the family back together onscreen for what amounts to an extended episode, although they try to keep it more contemporary without the goofiness often found in the original sitcom. The laugh track is thankfully done away with here, while the music score gets with the times but still can't help riffing on the original theme song as before along with a few traditional Christmas songs. Most of the action takes place on the first floor of the Brady house, and if the set had been dismantled between the show's end in 1974 and now, you'd hardly know it. Having watched the series DVDs many times recently and knowing the house pretty well, I'd say the set designers nailed it pretty well here if they had to do everything all over again. The first scene even opens looking in from the back porch as many of the original episodes did, although the camera is clearly reflected in the windows which was never a problem before. Shot on film but posted on videotape, the picture quality here is adequate aside from a bit of analog video noise visible in fades to black. Bright colors, many of which didn't seem to exist prior to 1980, bleed just a bit. There's also a partial black line in many shots, just one line from the very top of the picture which wouldn't have shown up on conventional CRTs of the era. Thankfully the DVD shows no obvious compression artifacts. The mono sound mix, encoded in 2-channel Dolby Digital, stays properly centered- although the original network intro, which is currently viewable on YouTube, indicates "CBS StereoSound" onscreen, that was actually just a processing given to mono tracks which made them sound a bit wider across the front speakers, and quite annoying if you added surround into your system. Since TV first adapted stereo in 1985, many stations used this for their mono material but shortly after CBS also used it on their network feed for anything not produced with stereo tracks, so you're not really missing anything here with it being in pure mono. Hearing-impaired subtitles are included, which at one point incorrectly refer to Marcia as "MARSHA"- a sticking point for me as my two sibling cats are named Marcia and Greg after this show's characters and I often have to make sure people spell Marcia's name correctly. There are some who lived through and remember The Brady Bunch's original run enough that it doesn't trigger any nostalgia and would just as soon forget about it; seeing them reunite here won't change their minds. However if you remember the show mostly from reruns and you've grown to love its datedness, this will be as essential to have as the series sets have been. The real surprise here, having seen this special's original airing, is how dated it now looks in retrospect. (I certainly now regret not taping and keeping it; you can currently see all of the original commercials on YouTube with McDonald's as the main sponsor but the recording uploaded there is of rather poor quality.) With it now on DVD along with the original series and "The Brady Kids" cartoon series, we just need "The Brady Brides" and the later "Bradys" series for completeness' sake- a disc with two episodes of the Variety Hour was released by Rhino and is now long out of print, having all of those episodes out would truly be icing on the cake.